The ninth issue of Mongolica has the following parts: Historiography and Textology, Literature, Folklore, Linguistics, Reviews. Letters to the editors, Scholarly events, and Our translations. The articles are written both by competent and young Russian and foreign scholars in the field of Mongolian studies. The essays of the latest scholarly events, reviews of new books make the issue topical. The articles are written in the mainstream of the modern scientific priorities and from the positions of the modern state of Mongolian studies, where historical and cultural problems of Mongolian speaking peoples are very important. They play a significant part in the society and have general historical significance. The issue should be of interest to Mongolists specializing in philology, history, culture, and Orienta¬lists interested in the history of the Mongolian peoples and Central Asia. In 1914-1916 S. A. Kozin worked as a financial adviser to the Mongolian government. Basing on the documents kept in St. Petersburg Branch of the Archives of RAS the authors trace in detail Kozin’s appointment to this position beginning from the very idea of him as a nominee up to his appointment and arrival in Urga. They show that Kozin’s work in Urga was an important part of the general policy of Russia in Mongolia. Key words: History of Mongolia; St. Petersburg Branch of the Archives of RAS; financial adviser; policy of Russia in Mongolia. Ulus is the most important term for the political reality which existed in the XVII century Mongolia. At that time a good number of chronicles dealing with the dynastic succession of Chinggis Khan descendants was composed. They justified the legitimacy of the Hagan’s rule over the community. The author gives a semasiological analysis of the term, identifies its different meanings and typical phrases in which it occurs. Key words: politia, terms, the history of Mongolia, the Supreme power. The author analyzes the aims, tasks and results of two expeditions to Mongolia undertaken by A. Belinsky in the early 20 century. They were organized just after the Japanese-Russian War, when both Russia and China stepped up their attention to Mongolia and intensified their activities there. Basing on materials from the Military Historical Archive of the Russian Federation, the author draws a conclusion that the expeditions were negative in their results and damaged the relations between Russia and Mongolia. Key words: Expedition, Mongolia, the Mongols, the Chinese, history, archive. For the first time the attention is paid to the borrowing of the legal experience from foreign countries to the Mongolian law. It constituted a substantial part of the Mongol Emperial law and was inherited in the states which later detached from the Empire. The author analyzes the reasons and procedure for such reception in the Mongol Empire and the Chinggiside States in XIII-XV centuries. Key words: The Mongolian empire, Сhinggiside states, the Mongol Imperial law. The article is devoted to the role of vegetation, namely grass, in the world outlook and ritual practices of the Mongolian people. The author presents vocabulary connected with the grass in Mongol and Buryat, and concludes that the image of grass reflects ancient mythological views on the calendar, alternation of seasons , birth, flourishing and decay of nature. The grass is perceived by people as a sacred symbol associated with a variety of taboos, omens and rituals. The author shows that certain traces of mythology and archaic beliefs associated with the cult of the mother-progenitor have survived in the traditional culture of the Buryats. A number of functions in the ‘motherhood’ complex are analyzed and a conclusion is made that ambiguity of the parent space filled with feminine attributes, rules of conduct, etiquette, taboos is caused by polisemantics of signs and symbols of the spiritual understanding of the role and place of women in the Buriat’s mythological consciousness. Key words: The Buryats, the motherhood, the traditional Buryat culture, mythological representations, the mother-progenitor, mentality. The article deals with the ethnic identity of a minority living on the territory of modern China - Tuzu, which attracted the attention of European, Russian and Chinese researchers in 19-early 20 centuries. The author traces complex relationships between peoples living in Central Asia which formed different states at different times. Key words: The Tuzu, Mongolian Studies in Chine, historical sources, ethnos, ethnogenesis, ethno-origin. In this paper a comparison of data on the history of Mongolia (12th-13th centuries) is made. Having compared the data available in three sources (namely, the famous Secret History of the Mongols, Muizz al-Ansab and the well-known work by Rashid ad-din). 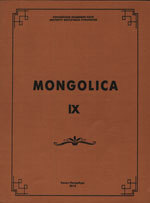 The author makes up a conclusion that Muizz al-Ansab is a unique source on the genealogy of Chinggisides and the history of the Mongol Empire, which has many new facts on the genealogy of the Mongolian nobility - nojonov and Chinggisides. Key words: The Mongol Empire, the Mongolian history, the Chinggisides. The author analyzes the Mongolian translation of a Tibetan Buddhist philosophical work of Lam-rim type, written by Gampopa, a famous cleric and literary figure of the 17th century. According to the results of comparison of the original text written in Tibetan with the Mongolian translation, the author came to conclusion, that the translation represents an abridged edition of the particular work and aims at giving the reader a short presentation of the Buddhist path. Key words: Buddhist philosophy, the Tibetan literature, the Mongolian literature, the translation. The paper analyzes the colophons in medieval Mongolian texts from the point of transmission of linguistic knowledge concerning the language system and practice of translation at that period. Special attention is paid to the regularity in their structure, basic terminology, vocabulary and grammar structures used in the colophons. Key words: Written culture, the Mongols, colofon, a source, the Mongolian language, the Central Asia. Tengrist mythology with the pantheon of ancient deities and mythological picture of the sacred universe is of great importance for determining the status of the Buryat epic Geser. The latter combines the spiritual heritage of the Buryats and the relationship with the Central Asian culture. The tengrist mythology presented in the Geser epic represents the quintessence of Uranus views of the Buriats. Key words: Mythology, Uranic representations, concept, tengrist-mythology, the Buryat Geser. The article is devoted to the poetical work of one of the representatives of the new galaxy of poets in ‘post-Soviet’ Mongolia - Baataryn Galsansukh, who has undergone the influence of modernist and post-modernist trends. Analyzing the famous book of his verses bearing the outrageous name A Hundred Year War for the Renewal of Poetry, the author draws attention to artistic images and discoveries new for the recent Mongolian poetry. Key words: The Mongolian modern poetry, the lyrical hero, image, semantics, modernism, text structure, poetic picture of the world. The article of the British scholar is devoted to the work of a prominent Mongolian poet of 20 century, an excellent translator from Russian - B. Yavuuhulan who had a great influence on the following generation of young Mongolian poets. The author speaks about the poet’s poetical methods, the images he used, his artistic vision of nature. Key words: The Mongolian modern poetry, lyrics, image, a poet, poem, translation. The author traces the history of studying cumulative-type tales in Europe and for the first time analyzes the composition and structure of the Mongolian cumulative tale. Cumulation is proved to be one of the elements of a fairy tale. Key words: The Mongolian national fairy tale, cumulative, folklore, structure, composition, the character, a plot. This article gives some results of several international folklore expeditions undertaken on the territory of Mongolia over the past five years. The aim of these expeditions was to collect Mongolian ‘long’ songs, to study their existing, preservation in different areas and local features of singing. The songs were classified according to the area, performance style, content, structure, principles of versification, their use during various ceremonies. The author is interested in zonal, local and regional characteristics of the songs distribution area. The so-called ‘low mythology’ which deals with demons and spirits, i. e. the beings belonging to the other world, occupies a special place in the traditional beliefs of the Mongolian peoples. The author analyzes the visual code of the characters from demonological folk prose, which bears information about the creature’s image and functions. Key words: Demons and spirits, folklore, literature, prose, the Mongolian peoples. The author describes the features of verbalization of such concepts as ‘light’, ‘moon’, ‘sun’, ‘sunrise’, ‘sunset’, ‘a mirage’, etc. in the Mongolian languages. Phonosemantic analysis, the author believes, proves the ability of the sonant [r] to reflect deep semantic evolution and allows with a sufficient share of the sequence to reconstruct the pra-Mongolian language state. Key words: interlingual contacts, the lexical form, the Mongolian language, translation, lexical interaction, administrative-territorial terminology. The author studies the artistic style of the famous Buryat playwright A. D. Batozhabay. This article describes the phraseological units in the language and speech of characters in his plays. The functioning of the phraseological units in the Buryat language, as shown by the author, proves the universality of theories put forward by Russian and foreign linguists. Key words: The Buryat phraseology, drama, phraseological unit, stylistics, colloquials, аdgerent-expressiveness. The camel, providing transportation of goods along the Great Silk Road, was able to reach distant areas in the Middle East and therefore became an integral part of the Asian and African culture whose history is connected with the nomadism. The article deals with the image of a camel, a character from the Mongolian and Arabic folk literature, symbolizing the virtues of a nomadic society. Key words: the Mongolian literary tradition, the Arabic literary tradition, the Central Asia, phraseological unit, the Arabian world, image of a camel. This article describes some archaeological findings and pieces of art kept in the Hermitage museum. They belonged to various peoples which inhabited the territory of modern Mongolia from the ancient times to the early 20 century. Much attention is paid to the items from the most famous archaeological complex of the nomadic culture of the Huns (Xiongnu) - the Noin-Ula burial mound. They were brought by an outstanding researcher and explorer of Central Asia P. K. Kozlov from his last expedition to Mongolia in 1923-1926. Key words: The state Hermitage, the Mongolian collections, Noin-Ula, nomadic material culture, animal style, the Mongolian sculpture, the Buddhism.